SureLAN® 6 F/UTP DataGuard® Armoured | Belcom Cables Ltd. Screened data transmission cable for 350MHz. 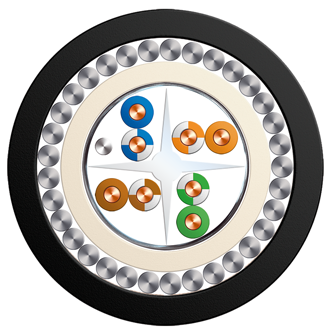 Usable for high quality requirements, all current data-services as well as Gigabit-Ethernet. Installation is easy because of a central element (cross) no individual shield is required. Usable for: 10Base-T; 100Base-T:1000Base-T; CDDI/ TPDDI;ISDN;ATM 155 Mbit/s, TP-PMD 125 Mbit/s, Token Ring 4/16 Mbit/s, analogue telefony.